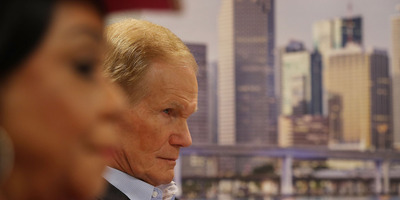 Florida Sen. Bill Nelson has claimed the Russians have “penetrated” state systems ahead of his re-election bid. Florida’s secretary of state said they do not have any evidence of what Nelson has claimed, and began probing federal agencies for answers. But so far top agencies and the Senate Intelligence Committee have been cagey in their responses, leaving Nelson without evidence of any interference. Nelson’s challenger, Republican Florida Gov. Rick Scott, has seized on the claims by questioning whether he made it all up or potentially divulged classified information. WASHINGTON – When Democratic Sen. Bill Nelson, who is up for re-election in Florida this November, said the Russians have penetrated state voting systems, it set off alarm bells across the state. But in the days since, Nelson has not shown any proof – and various officials have not provided any either – leading to a brutal political fight with his Republican challenger, Gov. Rick Scott. It started when Nelson told the Tampa Bay Times that Russians were interfering in the 2018 campaigns in Florida. “They have already penetrated certain counties in the state and they now have free rein to move about,” he said, adding that elaborating any further was classified. “We were requested by the chairman and vice chairman of the Intelligence Committee to let the supervisors of election in Florida know that the Russians are in their records,” Nelson added. Nelson’s claim was important because other Senate campaigns have been targeted as well. Sens. Claire McCaskill of Missouri and Jeanne Shaheen of New Hampshire, both of whom are Democrats, have reportedly been hit in recent months. But Nelson’s lack of details prompted Scott to question his claim, suggesting he fabricated the whole thing. State official appeared to have no idea what Nelson was talking about. Because the serious claim that Russians were already interfering in the state caught the attention of Florida’s Secretary of State Ken Detzner, he asked both the Department of Homeland Security and the FBI to address the matter. Neither agency responded to Detzner by his deadline at 5 p.m. on Monday, Revell confirmed to Business Insider. In addition, Sen. Richard Burr, who chairs the Senate Select Committee on Intelligence, sent a letter to Detzner neither confirming nor explicitly denying Nelson’s claims. Burr’s letter noted that the committee released its recommendations on election security in May, but deferred to the relevant agencies regarding any “intrusions” by hostile actors.